Heartburn symptoms vary. They may be slight or extreme. The severity of heartburn may depend on what you have eaten and how much you have eaten. The main symptom of heartburn is a burning feeling in your throat and chest. This happens when when the acidic liquid from your food or drink comes back up into your esophagus. You may have difficulty swallowing or choke on this acid. It may even make you hoarse or cough. When you eat, food passes from your mouth down a tube called the esophagus. The esophagus is about 10 inches long in most people. To enter the stomach, the food must pass through an opening between the esophagus and stomach. This opening acts like a gate to allow food to pass into the stomach. Usually, this opening closes as soon as food passes through. But if it doesn’t close all the way, acid from your stomach can get through the opening and into your esophagus. This is called reflux. Stomach acid can irritate the esophagus and cause heartburn. You probably do not need a doctor to diagnose heartburn. Heartburn symptoms are easy to recognize. And there are many over-the-counter medicines to help manage symptoms. If you are questioning whether you have heartburn, you should ask your doctor. He or she will likely be able to diagnose you based on your symptoms. Can heartburn be prevented or avoided? Many things can make heartburn worse. Heartburn is most common after overeating, when bending over or when lying down. Pregnancy, stress, and certain foods can also make heartburn worse. Coffee (both regular and decaffeinated) and other drinks that contain caffeine. Fatty foods or spicy foods (such as pizza, chili, and curry). Aspirin or ibuprofen (one brand name: Motrin). Certain medicines (such as sedatives and some medicines for high blood pressure). pH test to check for acid in the esophagus. Endoscopy to check for other conditions. During an endoscopy, your doctor looks into your stomach through a long, thin tube. This tube is inserted down your esophagus. Your doctor may also check for pylori, bacteria that can cause ulcers. Several kinds of medicine can be used to treat heartburn. Antacids neutralize the acid that your stomach makes. For most people, antacids that you can get without a prescription (over-the-counter) give fast, short-term relief. However, if you use antacids too much, they can cause diarrhea or constipation. Look for antacids that contain both magnesium hydroxide and aluminum hydroxide. One causes constipation while the other causes diarrhea. So they counteract each other. Some brands of antacids include Maalox, Mylanta, and Riopan. Follow the directions on the package. H2 blockers (some brand names: Pepcid, Tagamet, Zantac) reduce the amount of acid your stomach makes. Several are available without a prescription. Other medicines, such as omeprazole (brand name: Prilosec) and lansoprazole (brand name: Prevacid), also reduce how much acid the stomach makes. Metoclopramide (brand name: Reglan) reduces acid reflux. To find out what medicine is right for you, talk with your doctor. Sometimes pain in the chest may be mistaken for heartburn when it’s really a sign of heart disease. If you have any of the symptoms below, call your doctor. You have pain when you exercise. You have heartburn often (more than 3 times a week) for more than 2 weeks. What are some over-the-counter medicines that treat heartburn? Which ones do you recommend? 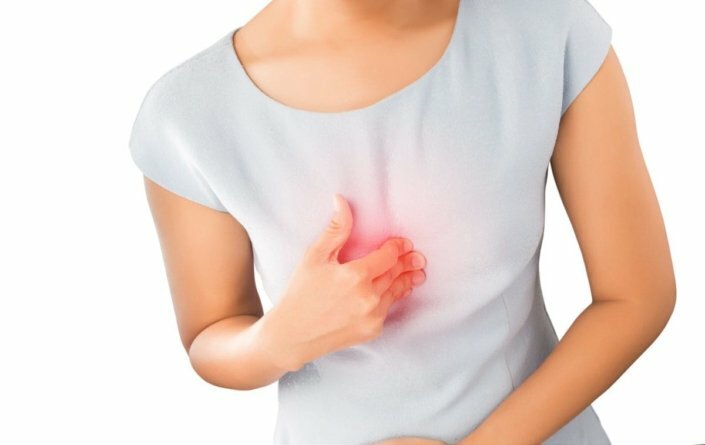 What is causing my heartburn and what can I do about it? Are there lifestyle changes I can make that will prevent heartburn? Is heartburn a sign of another condition? My favorite foods are causing heartburn. Besides avoiding these foods entirely, what can I do to prevent heartburn?